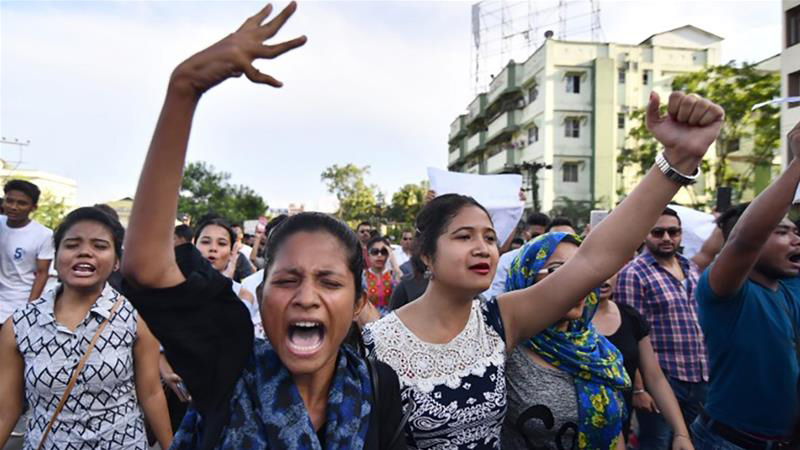 Police in the Indian state of Assam have arrested at least 18 people in connection with the lynching of two youths following rumours on social media and WhatsApp that they were child traffickers. Abhijit Nath and Nilotpal Das were beaten to death on Saturday by a mob of around 200 people in a remote village of Karbi Anglong district, some 200km east of the state capital, Guwahati. The duo is the latest victims of rumours circulating on social media, particularly WhatsApp, about the child kidnapping gangs. "We have taken strict measures against the culprits and arrested 18 individuals. We have also arrested some persons who were involved in spreading rumours on social media," Director General of Assam Police (DGP) Kuladhar Saikia told Al Jazeera. The clip of the lynching was widely shared on social media, which showed Das pleading with folded hands: "Don't kill me ... Please don't beat me. I am an Assamese … Please let me go." Nath, 30, and Das, 29, had gone to remote Panjuri Kachari village on Saturday for sightseeing in a black four-wheel drive, when they were chased and beaten to death on the suspicion of child kidnapping. "There was a rumour that some child abductors had entered our village. This was shared via WhatsApp and Facebook. The message also read that one of the abductors had long hair," said a village woman at Panjuri Kachari village who didn't wish to be named. "The youth were stopped and asked about their whereabouts. But in between some local people came and started thrashing them," the woman said. Following the incident, police have alerted all the districts to keep a strict vigil on social media and rumour mongering. Assam Chief Minister Sarbananda Sonowal has asked the state police chief Saikia to ensure that the police force maintains vigilance to ensure peace. Mob lynching is a primal instinct. No one knows why they are lynching, but all seem to be cast under a spell to kill. "I urge everyone to maintain peace and social harmony and not to fall prey to rumours. We won't spare anyone and strictest of punishment will be given to the culprits," the chief minister posted on Twitter. Meanwhile, Assam government has decided to constitute a special unit for cyber monitoring to prevent attempts to spread rumours and to cause social disturbances. The incident has caused an outrage, with thousands of people coming out on the streets of Guwahati demanding justice for the victims. Das, who sported dreadlocks, was a musician based in the state of Goa, and Nath was a Guwahati based businessman. Gopal Chandra Das, the father of Das, said that his son always enjoyed outdoors. "He travelled many places in the country. He loved to go to the hill stations. He would play music and wanted to do something, but destiny had other plans. I asked him not to go alone there (Karbi Anglong). But he went ahead," said the senior Das as he burst into tears ahead of the last rites of the two youths in Guwahati. Mob violence spreading through social media has been on the rise in India. During the last two years, more than 10 such incidents have been reported from different parts of the country. Last May, two youths were lynched in Assam's Nagaon district on the suspicion of stealing cows. "Mob lynching is a primal instinct. No one knows why they are lynching, but all seem to be cast under a spell to kill," activist Tinat Atifa Masood told Al Jazeera. "Over the last few years, the number of people lynched has gone up. A person is lynched for being different from 'the others' in their looks, culinary choices, their attire and their philosophy. And since the government of the day has been quiet on this issue, the ugly head of mob lynching is now a new normal in India," she said.